In this class students work toward team-building, sharing responsibility, and respecting others. They learn and improve proper vocal production, range, breath support, music reading skills, and listening skills. Appreciation for various styles of choral music is stressed. There are two major performances per year. The purchase of a choir dress is required. Students work toward team-building, sharing responsibility, and respect for others. They improve vocal production, range, breath support, music reading skills, and listening skills. Expanded appreciation for various styles of choral music is stressed. There are two major performances per year. The purchase of a choir dress is required for those who were not members of freshman choir. 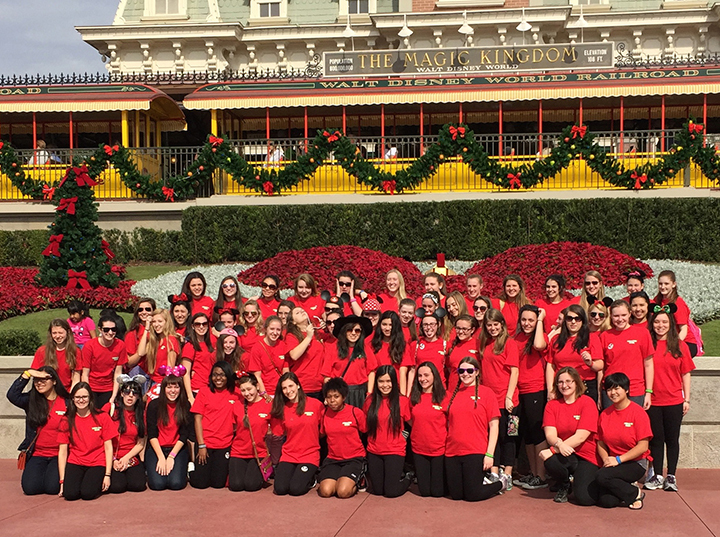 This is a chamber choir whose members serve as “musical ambassadors” to school and community. Emphasis is on proper vocal production, intonation, musicality, solo and choral repertoire, and music reading. Students work toward team-building, sharing responsibility, and respecting others, with many opportunities for performances throughout the year. Purchase of a choir dress is required. Symphonic Orchestra is a performance ensemble comprised of string instruments (Violin, Viola, Cello, and String Bass), Woodwind, Brass, and Percussion (including piano), guitar and electric bass. The group studies artistically, intellectually, and emotionally challenging band and orchestra literature ranging from traditional to contemporary styles. Improving individual musicianship and technique are emphasized as well as player collaboration to assure success as an ensemble. Symphonic Orchestra meets twice a cycle in sectionals (strings/woodwind, brass, and percussion), and twice a cycle as a whole ensemble within the regular school day. Students are required to practice outside of school for at least 40 minutes per week. Symphonic Orchestra performs at two concerts (winter and spring), LH Open House in the fall and Discover Lauralton in the spring. Musicians are expected to have some prior experience on their instrument, but new students are encouraged to join! Opportunities also exist for students to learn additional instruments, and perform in smaller groups with teacher approval. Senior instrumentalists are featured in the spring concert. Attendance is mandatory at all scheduled performances, including the two formal rehearsals the day prior to each concert. Purchase of a concert outfit is required. Jazz Ensemble is an advanced performance group comprised of approximately 20 to 25 students selected from within the Symphonic Orchestra, but is also open to Lauralton students who are not enrolled in Symphonic Orchestra. The ensemble will be exposed to many different styles including jazz, blues, swing and rock. Students will perform pieces that allow them to further interpret rhythms, harmony, theory, and be introduced to improvisation. The group performs at the Christmas and spring concerts as well as having the opportunity to perform at other events during the year. There will also be opportunities to attend festivals/contests in the spring. Attendance at performances is mandatory, especially due to the smaller size of the group. Rehearsals will take place during regular class time, with a few brief practices scheduled outside of the regular class schedule. The Milford United Percussion Ensemble (M.U. ), is a competitive marching performance ensemble based out of Lauralton Hall. This unique group is open to any student from Milford high schools: Lauralton Hall, Jonathan Law, and Foran, and Platt Tech. The ensemble competes against area school and independent groups in the Musical Arts Conference (MAC). 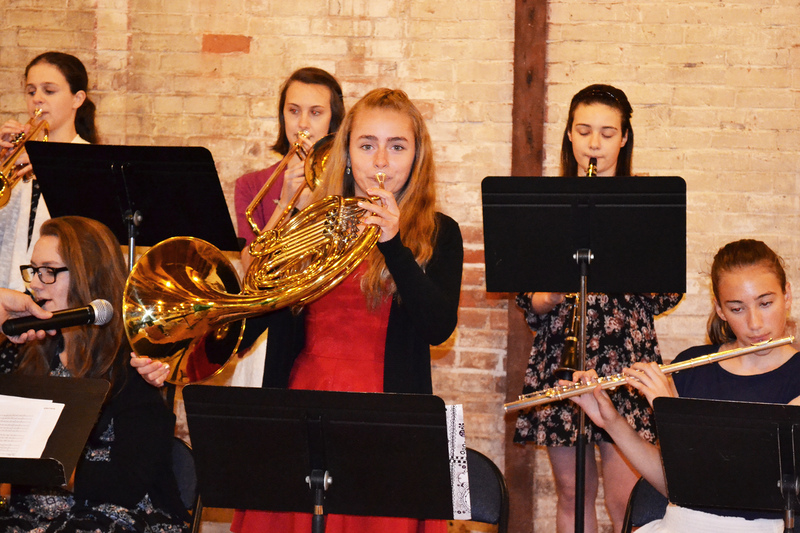 The ensemble is primarily made up of students who do not normally play percussion instruments, although many of them are in their local band, orchestra and choral programs. In addition, M.U. incorporates and encourages piano, guitar, and electric bass players. The group learns a 4-6 minute thematic show utilizing music from traditional, contemporary, Latin, African, and Asian music. It marches an original drill on a standard gym floor. Students have the opportunity to play on various traditional and non-traditional percussion instruments and learn skills in a variety of percussive techniques, movement and dance, musicianship, leadership, team work and sportsmanship. Our designers and instructors have performed and taught with some of the top high school and drum corps organizations across the country. Milford United starts in November and runs through the beginning of April. Competitions begin in March and end in early April. The group also performs at the Lauralton Hall spring concert. For more information about Milford United Percussion please contact Mark Allen at mallen@lauraltonhall.org. Music students are engaged and challenged through entertaining orchestral and choral literature from traditional, contemporary, and world music genres. Our ensembles perform at Christmas and spring concerts as well as other events at and outside of Lauralton Hall. 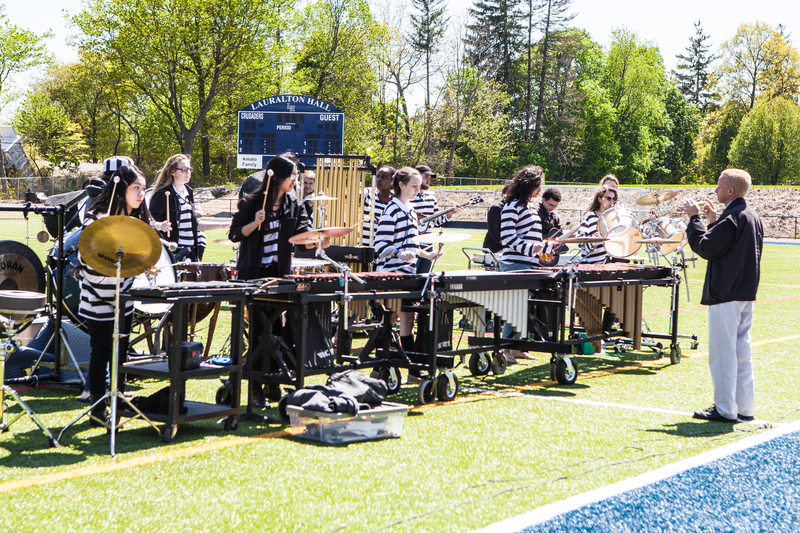 Additionally, our instrumental musicians perform with Milford United Percussion, which competes against other Connecticut ensembles in the Musical Arts Conference. Milford captured the top spot at the MAC Festival Class A Championships for the past two years. For more information about Milford United Percussion, contact Mark Allen at mallen@lauraltonhall.org.